The pumpkin department in our house has been under the management and control of John since he was two years old and he takes his role very seriously too! Growing something edible is a fantastic introduction to gardening for any child. 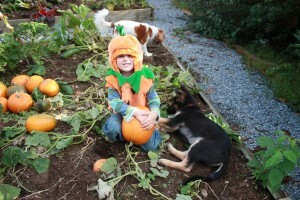 Pumpkins are fascinating for children as they take centre stage in such a big way at Halloween. It is a valuable lesson in understanding how long it takes something to grow as well. The first year we sowed some seeds John thought he would have pumpkins within a few days and it was torture for him. But he now understands the whole process and considers himself an expert on the topic. The seeds are sown in medium sized pots on the playroom windowsill every April. They are cared for intensely and several are drowned in the early days due to the natural desire of any small person to play with water. Those that survive are planted out in early June. We never bother potting them on as this can cause root damage (not to mention the potential damage to the playroom), hence the use of good sized pots per seed to begin with. This year we grew a large variety. Many of them rotted on the vine due to the dismal growing conditions. But although the crop is smaller, the spoils are bigger than ever and our resident pumpkin person is quite pleased. Pumpkins are very hungry and need to be planted into ground that has been given plenty of well-rotted manure or ‘Gee-up’. They need plenty of watering once planted out too. There are lots of things that you can do with a crop of pumpkins apart from cutting one onto a scary face. They are full of vitamins and like everything, should be eaten as soon as possible after harvest for the best taste and to benefit fully from their store of vitamins. John sells many of his to family members and friends and takes orders from September onwards. We roast the seeds to use in salads and to keep in jars for a nutritious snack. The seeds can also be used to start the process all over again next spring. Last year we made Thai pumpkin soup, it was delicious and I am already looking forward to it at the weekend! Things to do this week…. – Plant garlic in a well-drained, sunny spot. Avoid planting in heavy soil as this causes rotting. Plant the cloves two inches deep and four inches apart. Use only the biggest cloves and throw away the small guys. – Earth up leeks to get longer white stems instead of more green leaves. – November is a good time to plant bare root apple trees. Make sure you buy two trees from the same cultivar for pollination purposes. – An autumn lawn feed can be applied now to give the grass a late boost well into winter. – Start taking measures to reduce damage from frost. Buy a pair of pot feet or keep an eye out for pieces of broken slates or tiles for placing under your clay pots to prevent them from cracking and breaking. For larger plants and shrubs in the ground, B &Q are selling packs of two fleece bags for 7.45. This work a lot better than rolls of fleece as the bag comes right down over your plant and can be pulled tight at the bottom for extra insulation. After the last two winters I’m not taking any chances !